As marijuana quickly becomes more and more socially acceptable, millions of Americans are beginning to understand the lies that they have been told about pot. 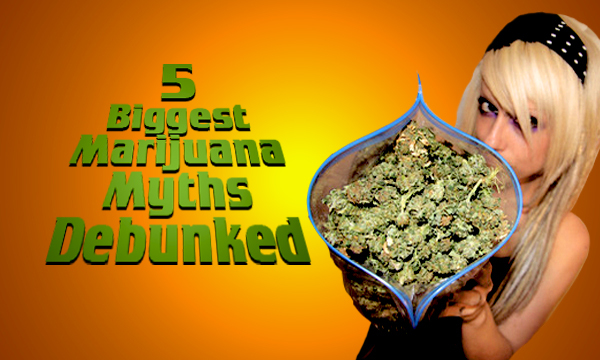 Here are the five biggest myths about weed that have prevented any kind of legalization movement from getting on a roll. While prolonged use has shown to leave signs of dependence, marijuana does not actually contain a “nicotine-like” compound that causes it to be addictive. (This is similar to being “addicted” to soda.) There are little to no withdrawal symptoms, especially when compared to the withdrawal effects of drugs like cocaine or heroin – or even an alcohol-induced hangover. Simply put, numerous studies have unequivocally disproved the idea that using marijuana leads to use of harder drugs. Marijuana has actually successfully been used to reduce hard drug users’ dependence on drugs. So, in reality, it is the exact opposite of a gateway drug. Another myth where the exact opposite thing is true: Not only have studied disproved the ideathat marijuana damages your brain, they have found that it actually protects your brain from the damage that heavy drinking can cause. The government has often defended its marijuana policy by citing their own studies that say that marijuana does not have any therapeutic effects. Not true. Aside from the uses listed above, marijuana have been proven to have beneficial effects on people suffering from migraines, glaucoma, AIDS, Multiple Sclerosis, epilepsy, stomach disorders, and dozens of other health problems. And, most recently, even the American Medical Association called for the government to remove its restrictive Schedule 1 status.